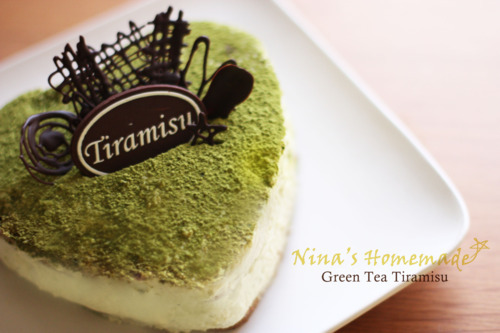 I made him a green tea tiramisu and gave it him after we had dinner at san carlo. 1. Wrap the bottom of an 8” cake ring with wax paper. 2. Soften mascarpone cheese at room temperature. 3. Dissolve gelatin in water in hot water bath. 4. Mix espressso with Bailey’s. 1. Cream egg yolks and 2 Tbsp of icing sugar with electric mixer. 2. Beat in mascarpone cheese and vanilla essence until fluffy. Beat in gelatin solution. Set aside. 3. Whisk egg whites and 2 Tbsp of icing sugar until stiff. Fold into mascarpone mix gently. 5. Slice round lady finger cake horizontally. Put one slice in the ring and brush with Bailey’s coffee mixture. 6. Pour half of the mascarpone filling over the lady finger cake. 7. Repeat lady finger, Bailey’s coffee mixture and filling layer. where can you get lady finger from?